Would you pay $10,000 for Apple Watch made of gold? 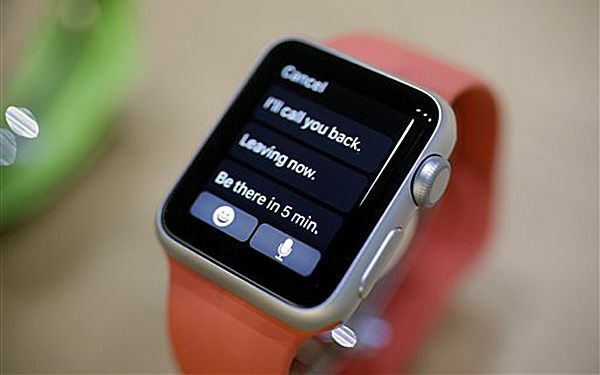 Apple wants to move the Internet from your pocket to your wrist. Time will tell if millions of consumers are willing to spend $350 on up for a wearable device that still requires a wirelessly connected smartphone to deliver its most powerful features. There's even an 18-karat gold version that starts at $10,000. But CEO Tim Cook is selling the Apple Watch as the next must-have device. He says it is able to serve people's information needs all day long, like no other tool has quite been able to do. "Now it's on your wrist. It's not in your pocket or pocketbook," Cook said before unveiling the new line. "We think the Apple Watch is going to be integral to your day." Apple wants this wristwatch to be seen as so revolutionary that it requires its own lingo. The watch piggybacks on a nearby smartphone's Internet connection through Wi-Fi or Bluetooth. The watch face provides most of the same information as smartphones do. But the back of the watch sends "taptic feedback." It taps the wrist to remind the wearer to get up and burn more calories. "It's like having a coach on your wrist!" gushed Cook. He also touted the potential health uses of a computer that sticks to your skin all day. The gadget introduces "digital touch." It is a way of messaging that enables people to draw and send little figures with their fingertips and have them arrive on a friend's watch face dynamically, in the same way they were drawn. Convincing consumers they can't live without an expensive new device isn't easy. But Apple's strongest selling points include "convenience and immediacy," along with high-end design features and some useful new apps, said Carolina Milanesi. She is a tech analyst with Kantar Worldpanel. "If you don't have to be fumbling around for your phone, that can make a difference," agreed analyst Patrick Moorhead. He is with Moor Insights and Strategy. Initial consumer reactions were mixed. Die-hard Apple fans were vowing to buy the watch immediately. Naysayers said they don't see the point of paying so much to see updates on their wrist instead of their smartphone. "I think it's a tough market they are trying to get into. And I don't see much promise that is going to come out of it," said Joshua Powers, 21. He is a junior at Emerson College in Boston. He owns an iPhone, an iPad and a MacBook computer. The starting price of $349 for the Apple Watch is only for the entry-level Sport model. Prices range from $549 to $1,100 for the mid-range watch. That's not out of line for a high-quality watch, analysts said. But Cook did not answer a key question for price-conscious consumers, Moorhead noted. How will Apple update the watch when it releases new models? Apple did answer another vital question. The company promised an estimated 18-hour battery life before the watch needs to be taken off and attached to a magnetic recharger. Numerous tech companies are already selling smartwatches. The Samsung Gear, Motorola Moto 360 and the Pebble Steel are on the market. Other models are being made by smaller, startup companies. Many run on Android Wear. It's the software platform from Google and the watches range from $100 to $500 or more. But most don't have as many features as the Apple Watch. And they have not been big hits with consumers. Apple executive Kevin Lynch walked through a simulation of a typical day. He checked the Apple Watch for messages and calendar items. He responded to a WeChat message and scrolled through some Instagram photos. Lynch also spoke with Siri. That is Apple's voice-activated digital assistant. Lynch spoke through the microphone on the watch. More impressively, Lynch presented an airline app. It has a bar code that acts as a boarding pass. Another app will open a garage door by remote control. And still another promises to enable wearers to check out at the grocery store with a single tap on the watch face. Cook also showed off features that can be found on many fitness bands already on the market. They include a heart rate monitor and accelerometer. The latter can track a wearer's movements and log daily exercise. But some design functions seem uniquely Apple. Wearers can twist a small knob and quickly select the face of a friend. Then the wearer can sketch an image with a fingertip that shows up dynamically, just like it is being drawn, on the friend's watch face. Swipe the watch face to bring up an email, then with a single tap, turn that email into a calendar item. Cook hinted at bigger goals, too. He announced that Apple has worked with leading medical institutions to develop an open-source software platform for iPhones to assist with medical research. He stopped just short of saying that Apple Watch, in combination with the iPhone, could be a key conduit for two-way delivery of health care information. For instance, it might send data about a person's metabolism to researchers while also reminding wearers to take their medicine or go exercise. Apple Watch will be available for viewing at Apple stores on April 10 and go on sale April 24. Critical thinking challenge: Google was not widely successful with Google Glass, which users wore like glasses. How might Apple's Watch, worn on the wrist, succeed where Google failed? Did your body complain about daylight saving time? Care for a dip in hot springnear Saturn? There is no way I would ever pay 10,000 dollars for a watch just like a phone. It is amazing how inventors are making this type of technology, but 10,000 dollars is way to expensive. i think this is a cool device because you can wear it. they look different then a phone because the way the way the apps are. I would not buy a $10,000 watch. Yeah it looks cool. But that is why we have phones. But i do have to say that sense people are starting to pick pocket they can take something thats on your wrist without you knowing. I still would not pay 10,000 even though it is gold. I don't even have this kind of money! 10,000 dollars is a lot to spend on one thing that can break with one drop. Kinda like a phone! You drop it, it cracks then you have to buy a brand new one. Google is Apple's completion and I think Google will win. Apple is having big problems with bugs and not being able to help customers. On the other hand Google when you call them they call straight to the operating system meaning to talk to a real person then a robot computer thing. Plus Google wouldn't charge 10,000 dollars for golden step-o-meter. Second, How do you know that it is real gold. Real gold needs to be tested to see. Apple can easily reaping you off in one second. And that's all I got to say! I think appple will sucseed more because a watch is more practical than glasses. The watch will be small and compact. 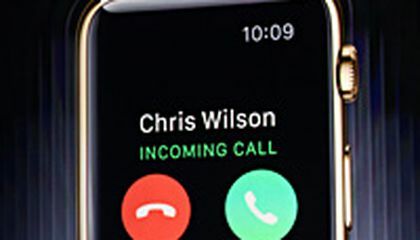 I think Apple will also sucseed because Apple has Phones that milllions buy, and if you put the same phone on thw watch people already know how to use tem. I woundn't pay $10,000 for a watch made of gold. what if i drop it and it breaks or gets scratched and i can't get it repared i'm not going to pay for a new one. FIrst of all why would you even spend that much on a watch when one you have your phone that does pretty much the same thing and more , second you can get a name brand watch for way less. i doubt that this watch would even be a success. Well thinnk about it. If people pay alot of money for an apple product or phone that comes out every year why won't they buy the watch. On top of that normal watches are just as popular and Apple being a really big company selling smartwatche, why wouldn't anyone want it or spend their money on it. The gold apple watch is a waist of money. Apple is selling non gold ones for 300 bucks why would you pay that much money for a watch?